Sunday, Smiling, and Why Being Nice Matters! 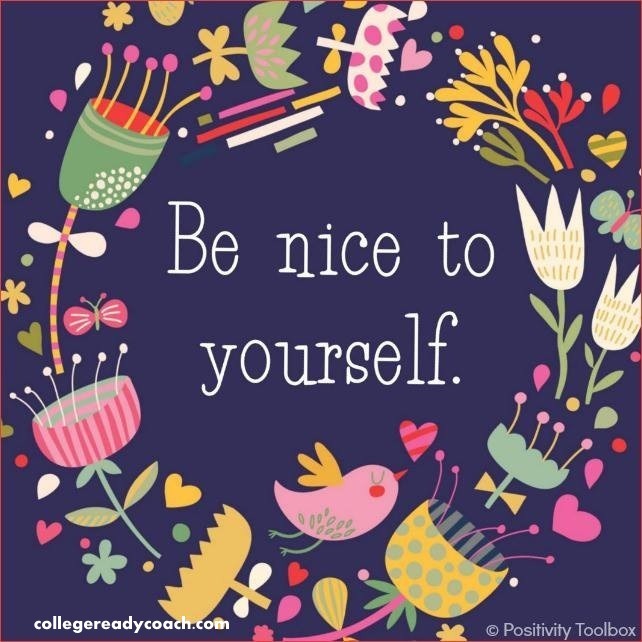 This is important: Be Nice to Yourself! Sunday is a good day for a little reflection, a little relaxation, and a whole lot of being nice to yourself. Smile. Breathe. Take a minute to recharge and get ready for the week ahead. Remember, studies show that the brain on positive is over 30% more effective than on stressed, or even neutral. How to get and stay positive: Be Nice…to YOU! Take some time to do at least one thing each day that is just for you. Even if that one thing is only 5 minutes in your day! Categories: Education, Happiness, News, Professional Development, Quotes, Social Media, Teaching, Uncategorized | Tags: 5 minute challenge, education, inspiration, life, love, recharge, stay positive, teaching | Permalink.